Dragon Warrior Kung Fu Master painting process. How to paint dragon warrior. Dragon Warrior Kung Fu master painting process. Here is a continuation of digital painting process from the previous Lone Warrior Kung Fu master dude sketch. The concept character is inspired by the fictional character "Northern Begger" Hong QiGong (洪七公; pinyin: Hóng Qī Gōng). Have some more times to play around with the image process. There still a lot to be done, correcting the color values, adding under lighting and refine the little detail here and there, hopefully the next post will be the final step by step process. Click here to see the next step by step tutorial process: Dragon Kungfu master digital painting process. FEATURE TUTORIALS: *Over 60 minutes to 2 hours of video. That's what I call badass right there. One of my fav pics of yours for sure! HEEEEYY Xia calm down ok!! :) You're running too fast! :P Badass. Agree with my previous comment. I love those wolves ideas on the back... too bad you removed them - they really had great expression. So, no more video -lessons? Chris & Luca> Thanks brothers, there are still many things I need to adjust, I felt the resent piece...the face has a little less impact and a little less threatening than the previous one with the white eyes. I sort of like the color intensity so far...cuz I will get to play with the bounce light. :) We will see where this will take me. Eating? Nah, just drinking more Vodka (not recommended, just kidding no alcohol until the work is done.). I was wondering if you could perhaps do your next tutorial as a kind of close up on a body part, demonstrating your blending technique with a lot of opacity and clarity. I'm going to browse through some of the brushes you've featured, maybe that's somewhere my problem is napping in. Kev, he definately uses both 100% and lesser to blend. Also soft and hard edged brushes help pop stuff out or smooth/distance it. There are a few tutorials talking about this somewhere too. If you try to use 100% as much as you can then you shouldn't end up with airbrushyness. Hope that helps. Awesome Xia, as always. 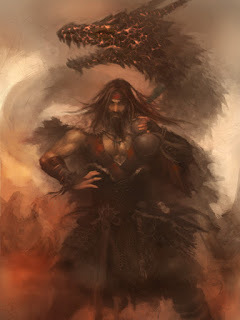 I love the dragon, he likes a spirit of fire :)The warrior looks great, I like the expression in his face. So far it looks frigging fantastic! This is awesome you are an amazing artist, one of the best especially drawing from value. I had to buy some of you videos just to learn more and support you sir! I am a big fan of westerns, I actually noted you on this but would you be willing to do a few western pieces, cowboys and cowgirls yee haw. I think this could add a missing element to your genre. MMMM.... interesting blog, amazing tutorials! Thank you Xia! Kevin> Chris already answer your question, and it is right. :) "airbrushy" looks usually the resulting from not having Hard Edge and Soft Edge interact correctly or in harmony. Yep, go watch the arm tutorial vid or the male torso vid. Notice light will travel along the surface, but when there is changes of surface plane (depending on how harsh) that's where edges occur and also depth can create edges. Chris> Thanks brother, right on spot. Hao WU> Thanks brother, will try to finish it my best. rukia> Thanks, will try to check it out, but my best bet it to post them in the community. There are some good artists there that will be able to give you pointers also. Whitenight222> Thanks brother, I have to admit I never really done anything western related. But maybe so in the future. Look up Jaime Jones and Craig Mullins. They are super badasses and they love western theme. anonymous> Thanks brother, it's coming along. Trying to find the way to improve it. Thank you so much I look forward to anything you post bud!